Ellesmere port minibus hire is the leading company in corporate travel all across the UK. We serve different businesses from small scale to medium and even global brands. Our sole aim to ensure that they all enjoy safe and comfortable transportation for all their corporate engagements. We have various vehicles in our fleet that can meet any group size. If you need to transport a small team to a location not so far away, we are up to the task. Even if you need to transport a large number of staff to a location that is miles away, we are also your best bet. 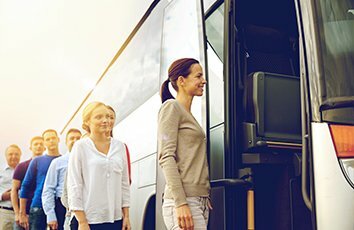 At Ellesmere port minibus hire, we also provide insurance and liability details in a bid to ensire that your business is up to date and complies with business law. Our vehicles are very comfortable and can take between 8-49 passengers. All you need to do is choose any of our vehicles based on your budget and preferences. For corporate use, we suggest you go for our advanced executive and luxury vehicles. These vehicles are well equipped with faciliites that will make all your employees satisfied and comfortable. Some of such fcailities include: on-board bathrooms, hot drinks machines, etc. We also have vehicles that have tables for very busy professionals to continue with their work, respond to emails, and prepare for meetings. These tables allow employers to use their laptops easily while on the road. In our luxury vehicles, you are sure to find a fridge that is fully loaded with free complimentary water. If you want, we could also provide breakfast or lunch on board. This of course comes at a cost. At Ellesmere port minibus hire, we are also experienced in attending to clients that have special dietary requirements. Some of such clients include athletes, football teams, etc. Even when such requirements seem very difficult, we are up to the task. We know that some people don’t eat certain foods due to their religion, we can also cope with such people. All you need to do is state all your requirements via a call or better still fill our online form. Our customer service team is always willing to help you.